The internet isn't a perfect place, and one of the reasons why is clickbait. You see it everywhere, and there's nothing anybody could do about it... until now. A team of 100+ individuals called "Stop Clickbait" (previously here and here) are the unsung heroes we so desperately need because they do the clicking so we won't have to. 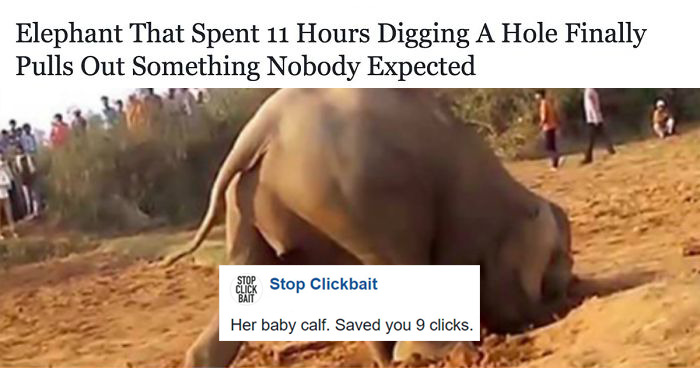 'Stop Clickbait' share the pesky clickbait articles along with a short reveal that uncovers what the title was so desperately hiding. "I started 'Stop Clickbait' in May of 2016 as a fun little side project," the man behind the idea, Daniel Tuttle told Bored Panda. "I am an advertising major so over the years I’ve become very cynical when it comes to advertising. I am quite fascinated by the spread of online ads and started to think it would be not only hilarious but useful for many to go against the economy of the Internet; ad revenue. Within a few days it blew up with viral posts across social media channels and since then there have been vast amounts of support coming from all over the world. Since then, we have expanded into 10 different pages to specialize in different categories of clickbait as well as in 12 different countries around the world." Daniel believes that with the right approach the internet could get rid of clickbait altogether. "Social media companies need to provide tools to content producers to incentivize them to keep their content on their social media page," Tuttle said. "One way they can do this is to provide options to generate revenue by posting on social media like Facebook or Twitter. Right now there are no ways to make money directly through social media thus content providers are needing to redirect their traffic somewhere where they can be more profitable like their website. "Another thing we fight for is to promote media literacy. By being able to read a headline and tell the difference between a journalist with integrity or simple someone using sensationalism to generate a click, the user can make an educated decision on who to support." "We are the little people joining together to fight against the media giants, and we're having an impact. It's time to fight against the economy of the Internet; it's all in the name, it's time to stop clickbait." See the examples below for a better idea of this sweet, sweet justice, and upvote your favorites! This one is actually useful to click on. Come on guys, people click out for fun. Don't take that away from us, besides it's better than talking to people. Would they ever admit it had they found it, though? I kinda want to know how it got there. This one is... starteling, the question I mean. Is there a bet running about who would make up the most unlikely end as possible ? Ok, then, my turn: She was impale by a yellow unicorn after she stept on her 3 meters rainbow tail. "Soundgarden - Black Hole Sun"
So basically to be happy at work you should stop working? Ah yes, a sinking crab is one hundred percent the most mesmerizing thing ever. Actually, it literally depends on basically where and when you honestly actually use them. Like, who doesn't know that? "Can bloody clickbait kill you?" "Yes, if you get too much you might jump off a bridge." this is why we spend milions for? Doesn't have much else to spend money on, so why not? As long as they're well behaved. 100% will fail to guess "why the duckface?" though! Know your clientele. If they pay $7 for COFFEE, you can give them the photo op that comes with it. That's great.... ruin a child's life over a coincidence. Thank God she wasn't born on Dung Beetle Day. I had no idea it changed. I thought we all just said KFC because it's shorter. Well, it would also be good to remind ourselves that previous generations had lot of kids mostly because they didn't have the choice. My maternal grandmother had 5 kids (the other one 7....). Her first born was still wearing diapers (not disposable at that time) that she had 2 sisters. My grandfather bought the first washing machine in our home town, a machine that did not spin the laundry... trust me my grandmother wouldn't have 5 kids in 8 years (probably not even 5 at all) if they could have plan the pregnancies. I've seen so many of these stupid articles about the solar probe. Too many of them think the probe is actually going to the sun's surface. And the battery worked for 13 years? This third season got less funny and more just, bizarre. Why does the illustration for Amanda Bynes' fact shows Ashton Kutcher and Demi Moore? 'Wins the Internet' - also Bored Panda uses this.. Shouldn't she just not watch HIM then? I assume there are multiple rooms in their house. I assume this is just a "dramatic title embellishment". This sounds to be super vital information. What was ironic about it, though? Or better: plant a lot of flowers and stop madness of "flawless" lawns and stonegardens.... Both are dead for nature. Oh, if wishing made it so. He originally had a life expectancy of 2 years after diagnosis. Lie detectors don't "prove" anything anyway. It's outrageous. Al Bundy said: don't do it. This is actually a great article from Forbes. So the response should have been "He didn't. It was a hoax." so complicated... so... no white? I prefer 6:30 AM to 11:00 PM. They're dogs. They don't understand "work". As long as they're together with nice people and getting treats and pets, they're happy. If you have time to find out how many pixels off center the Spotify pause button is, you might need a hobby. This has been true for a long time. My coworkers used to go as a group with only one membership card, and that was more than ten years ago. Oh? I thought these were still very common in Europe? Is this technology dying already? Again, we need ro know why.